The OH often complains about my mash (maybe that’s why he won’t marry me!) He’s a harsh critic and often grumbles that my mash is not only lumpy but often cold. I’ve tried to improve my mash over time, striving to keep the food critic happy. I’ve tried adding different kinds of milk, butter, cheese etc. I’ve tried at least 3 different mashers, I’ve tried working out on my arm muscles more (lie) and I even asked the mash lumps politely to separate, oh pretty please. OK I may have elaborated slightly on all of the above. The OH doesn’t complain that much but his polite nods and grimacing face whilst eating my mash indicates he’s not a fan. Enter the Masha into The K-D’s world. It’s a good looking gadget, and has the feel of a hand blender about it. It’s a nice bright colour and doesn’t have any sharp, scary bits. The instructions were simple and short and taking it apart to clean is very easy. The test in our house is whether the OH can put the parts back in the right place after its been washed, and it passed! I tried mashing some bananas first. 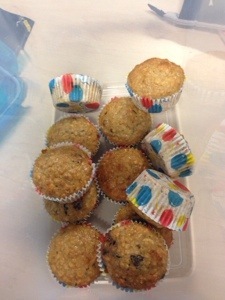 Blackening bananas are forever lurking in our kitchen and I often bake them into some muffins. I normally mash the bananas with a fork but tried the Masha instead. It was very quick, seconds in fact and all I needed to do was knock the remaining banana mush off of the Masha before washing. Next was the dreaded potato. 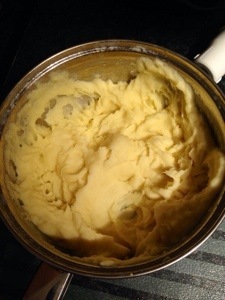 I added some milk and a bit of butter to the boiled potatoes and was pretty impressed with how quick it was to mash up and the result was lump-free! The process was so quick that the mash remained steaming hot. Add the chickpeas, garlic, lemon juice, cumin seeds, tahini and salt to a large bowl, before using the Masha to produce a smooth consistency. Add small amounts of the water from the chickpea can whilst mashing. Add more lemon juice, salt, garlic and cumin to taste as desired. The entire process took next to no time. For the next batch I’m going to add in some sweet chilli sauce, just for a little kick. I am very proud of the end product. I know for some of you hummus is childs play but for me this is life changing! I’m now welcoming the Masha into my kitchen with big, open arms. It’s a great gadget to have and I feel the vegetable world is my oyster! I know my life is a rollercoaster! Disclaimer: I was sent a Masha to review and share my opinions about on my blog. Everything written above is my own rambling thoughts. 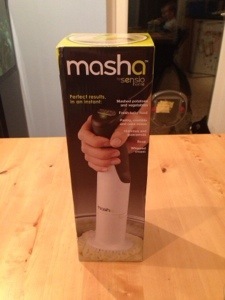 Masha – a brilliant new kitchen gadget that makes perfect mash (potatoes/veg); soups; batters; dips etc – Looks similar to a hand blender but has a rotor cone technology which creates great consistency of mash and other foods. Lol I use a ricer after learning how to make gnocchi in Italy… Does the masher not make it too starchy? I’m intrigued? Yikes I am so behind with my comments, so sorry. 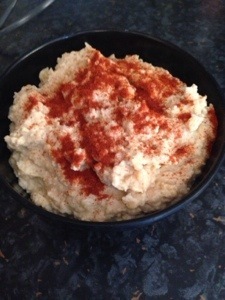 For a first attempt I was quite pleased with my hummus. It was lumpier than the average kind but I just take that as more authentic and made with love! Maybe I should travel around Europe a bit learning about foods, call it research!